Recipe for Basic Miso Soup. 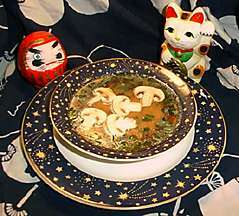 A staple of Japanese cuisine, miso soup is served with nearly every meal in Japan, including breakfast. Heat oil in bottom of small pot, add green onion (if using) and cook for about a minutes stirring frequently. Add 2 1/2 cups water. Dissolve miso in 1/2 cup water and add to pot. Bring to a boil. Lower heat, add mushrooms and tofu if desired. Serve.